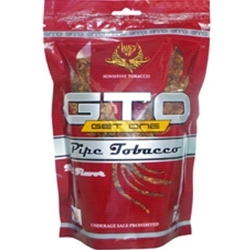 GTO Pipe Tobacco is produced with a classic American blend of high-quality flavored tobacco. GTO Pipe Tobacco gives little to no bite, with a very light and mellow flavor producing a nice aroma with a smooth finish. Offered here at our online tobacco store, GTO Pipe Tobacco is priced perfectly as a smoker’s best friend. This premium mixture packs easily into any shape smoking pipe, perfect for an all-day smooth and aromatic smoke. Each pouch of GTO Pipe Tobacco are available at our online tobacco store in unique styles to choose from. Full Flavor, Light, and Menthol. Our online pipe tobacco store offers great deals and inexpensive ways to save money on over-prices retail brands. GTO Pipe Tobacco can be the right choice for your smoking needs. Here at Smokers Discounts we’ve made it easy and affordable to buy pipe tobacco online. Call us for more details!